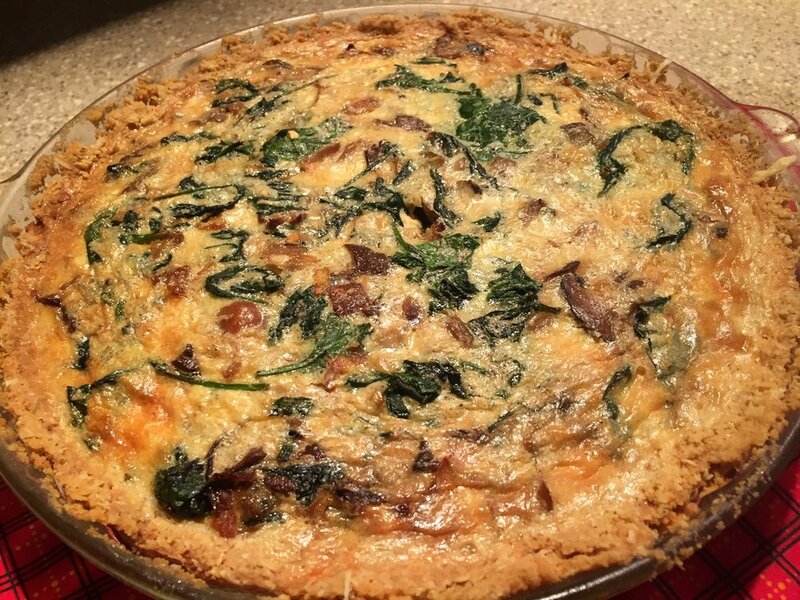 This blog is about how I made a quiche that had a too thick soggy crust so I adjusted the recipe for another quiche that was much improved. I think I’m going to try a few more improvements in the future, but till then here’s The Evolution of a Quiche Recipe. Quiche 1 - with spinach and shitake mushrooms. This crust was too much! Quiche 2 - Spinach and a mixture of mushrooms. Much improved crust! The first quiche had too much soggy crust. The filling was delicious so, I thought it was worth a second try. I made some adjustments and the crust on the second crust came out crispy and well proportioned. I cut the mushrooms into bite size pieces allowing the custard to fill the tart and creating a browned top. The crust and the filling were equally yummy! Quiche 1 - Beautifully baked quiche, too bad the crusty was too thick and soggy, and the mushrooms were too big. Quiche 2 - Another beautiful Quiche and the crust was perfect! Quiche is one of the most versatile dishes you can have in your menu toolkit. It is easy to make with simple ingredients. If you plan ahead and shop for shredded cheese and pre-made pie crusts you can have this in the oven in less tjan 15 minutes. It bakes in 35-40 minutes. If you prefer you can use only egg whites and there are lots of gluten and dairy free options for the milk and cheese. The more vegetables the better! Use you favorites, what you have in you garden and what’s in season. Playing with the filings is one of the fun things about making quiche. Once you perfected your favorite crust the rest of the recipe is simple. Quiche a savory open tart or flan consisting of pastry crust filled with a custard made from eggs, milk or cream, and cheese. A quiche can have meat, seafood or vegetables added to it. Quiche was created in France. It can be served hot, cold or room temperature for breakfast, lunch or dinner. It’s also easily eaten with out a fork on the go. The 1995 edition of the Enchanted Broccoli Forest. It’s still hand lettered with Mollie Katzen’s drawings. Fresh grated nutmeg is much more fragrant than already ground. It’s the same with fresh ground coffee. A microplane makes it easy. One of my go-to cookbooks is The Enchanted Broccoli Forest cookbook by Mollie Katzen. 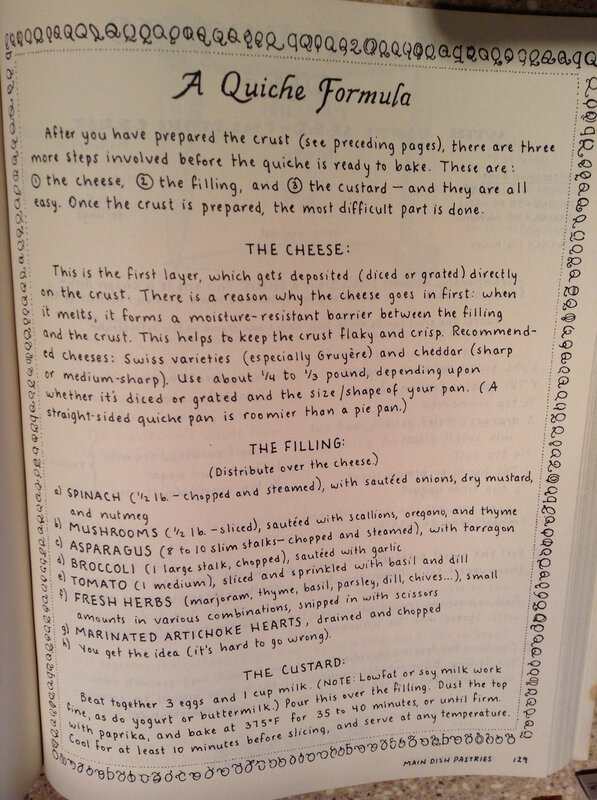 In the new (1995) version Mollie Katzen has made adjustments to the dairy heavy ingredients of the original book printed in 1982. As she says in the preface, we know more about nutrition and rely more on vegetables, soy and beans for a vegetarian diet. I haven’t made a quiche in years the quiche recipe sounded delicious and it looked easy to make. It was both! Mollie’s Quiche Formula is a great start to any quiche. I say start because, her formula is adaptable to your dietary needs, what’s in season and your favorite veggies. She provides the formula and you add the creativity. You can use ingredients that you might have in your kitchen. I do love a recipe that doesn’t require a trip to the grocery store. I did include Swiss cheese and milk on my last shopping list in preparation for this recipe, as these are 2 ingredients I don’t keep in my fridge. Press the crust mixture into a pie pan or quiche dish. Making it as even as you can. 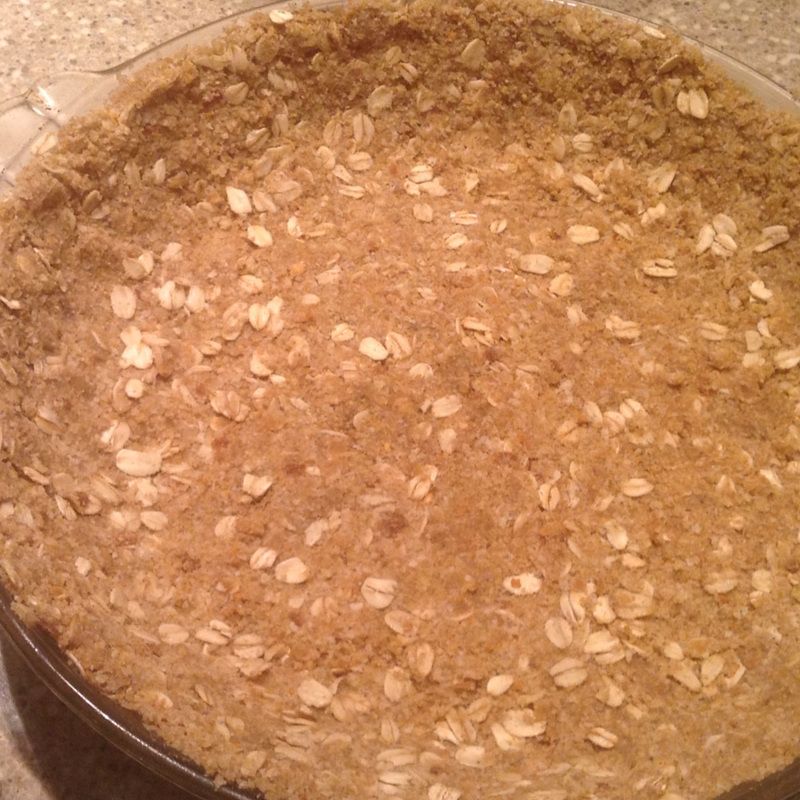 If you are gluten free or have a favorite pie crust you can use it here. Mollie has several alternative crusts in the cookbook, too. If time is an issue for you the pre-made pie crusts you find in the refrigerator section of you local grocery store will work just fine. Here’s the recipe for the second crust with the changes I made that was successful. 1/2 cup flour - I used unbleached all-purpose flour in the second crust. You could use whole wheat. Preheat oven to 375 degrees. Put the bread crumbs in a food processor until they are a fine crumb. You can do this by hand, too. Place the dry bread in a plastic bag and use a rolling pin to break the bread into crumbs. Add the flour, oats, seasonings and mix. Add the room temperature butter and mix until the butter is well distributed into the dry mix. Pat the mixture into a 9” deep dish pie pan or quiche pan. This took a little patience and some finessing to get it evenly distributed on the bottom and sides. I put strips of tin foil folded over the rim and baked for 15 minutes. Remove from the oven, remove tin foil and the crust is ready to fill. No need to cool it. Some recipes I read said that putting the cheese in the quiche crust first will help keep the custard from getting soggy. I’m not sure, but it can’t hurt. Cheese - I used 1 cup Swiss cheese that I grated it in my food processor after I made the crust and before the custard. Gruyere is good, too. I don’t know enough about non-dairy cheese, but you should be able to use them. Saute onions then add mushrooms. This was the same for both quiches, but I cut the mushrooms into smaller pieces. A lot of spinach cooks down quickly to a small amount. Filling - For both quiches the filling contained the same ingredients. 1 10 oz. package of frozen organic mushrooms - The 1st quiche was shitake, the 2nd was a mixed bag cut into bite size pieces. Saute the onions until slightly caramelized then add mushrooms. I used frozen, but you can use fresh. Be sure to boil off the extra liquid that happens when using frozen mushrooms. Then add the spinach. Putting a lid on the pan helps to wilt the spinach quickly. Next cover the cheese with the vegetables or your preferred filling ingredients. The final step is to pour the custard mixture into the dish. This picture is from the 1st quiche. I cut the mushrooms into bite size piece. It was easier to eat. Put all of the ingredients in a food processor or mixing bowl and mix well. pour the custard over the cheese and filing. Bake 35-40 minutes until the crust is browned and the filling is firm. You can test by sticking a knife in the center. It’s done when the knife comes out clean. Serve hot, warm or cold. A nice green salad makes this a complete meal. Enjoy! I’d love to hear about your favorite quiche recipes!